Early reports put this year’s September U.S. issue of Vogue at 584 ad pages, up from last year’s 532 pages. As an indicator of the economy, it’s a good recovery sign looking back to 2009’s 429 pages which was a huge drop from 2008’s 674. 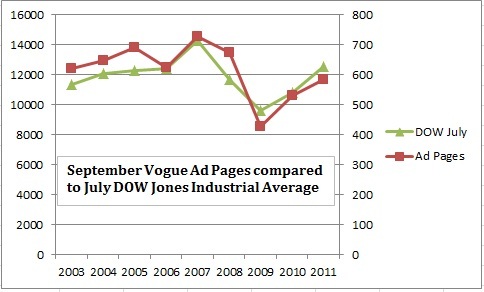 Since I’ve been tracking this data for several years now, I decided to do a very amateur analysis and made a simple chart comparing the ad pages in September to the Dow Jones Industrial Average in July of the same year. I picked July so that I would have a data point for 2011 (although the month isn’t over so it’s even sketchier!). A fancier graph would include more Dow data points in a year, but this is good enough for my little amusement. And I actually have 20 years of September Vogue issues, but I’m not up for counting all ad pages of the issues I don’t have data for! Anyway, there’s a good correlation when you put the DOW and page count numbers onto the same scale. E.B. White “felt for animals a kinship he never felt for people,” which can easily be seen from his children’s books. “The Story of Charlotte’s Web” by Michael Sims looks at both how the book was a reflection of its author and what the tale means to readers. White was inspired by the spiders in his barn and also Archy the cockroach to create the heroic title character. And the overarching theme of the morality of killing pets for food clearly comes from his love of animals. Almost 60 years later, “Charlotte’s Web” still ranks as one of the most popular children’s books. 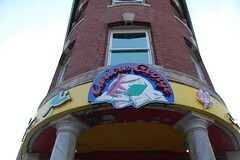 After Harvard Square’s Wordsworth bookstore closed in 2004, owners Hillel Stavis and Donna Friedman decided to focus on their other venture, a children’s bookstore named after Curious George. They opened the store in 1995 with the consent of Cambridge resident Margret Rey who created George with her husband Hans. In addition to books they sold games and crafts. Well, you probably know where this is going. The owners announced earlier this month that the bookstore would close. Lease negotiations, healthcare costs, and the oft-cited bad economy contributed to their decision. They attempted to save Curious George and Friends by turning it into a non-profit and asking the Cambridge City Council and the Rey’s Curious George Foundation for help, proposing a small museum. But no one has stepped forward to save the store. Joining it in the disappearance of independent bookstores from the historic square is the Globe Corner Bookstore which closes this week. Andrew Rossi’s “Page One: Inside The New York Times” is a documentary on print journalism at a time when many say the medium is dying. The print part may be gone one day, but journalism itself will continue. Times reporter David Carr, one of the film’s major subjects, tells the Seattle Times that originally he was the sole subject of the documentary but the camera was affecting his interviews so he asked Rossi to include some colleagues. That contributed to the film’s focus on only one part of the Times’ team, the Media Desk. Critics have pointed out the lack of women in the film and also that it excludes the Times’ investigative reporting team. As happens with the filming of real lives, only those who wished to be on-screen were willing to participate. Carr says “You’re seeing males, hambone little banty rooster males who were more willing to be on camera.” Of the lack of female participation despite the fact that 40% of the Times’ newsroom is women, Glynnis MacNicol at Business Insider sums up “it seems we only have ourselves to blame.” I’d rather think those who declined prefer to stick to their role of not being part of the story. In his “no conflict of interest here” review in The New York Times itself, Michael Kinsley recommends seeing “His Girl Friday” instead (great idea). For those so fond of Tiffany Blue that they would love to be entirely surrounded by it, the St. Regis Hotel in Manhattan has a suite themed for the jewelry store. The suite partnership between the St. Regis and Tiffany has been around for decades but the rooms have just been redesigned and refreshed for today’s luxury shopper. Behind door 1403, yours for $8,500 a night, lies 1,700 square feet full of silver and crystal accents, a dining room for 10, and plenty of that robin’s egg blue. The Tony Awards on Sunday were the first time I saw the remarkably lifelike puppet from the play War Horse. Created by the Handspring Puppet Company of South Africa, the life-sized horse takes 3 puppeteers to operate and adds to the depth and emotion of the staged performance. Also, Neil Patrick Harris got to make a grand entrance riding in on the horse as part of his Tony hosting duties (yes it can be ridden!). The two men behind Handspring Puppets spoke at TED about the design and craftsmanship of bringing the horse to life. The horse entrance is at 9 minutes in if you don’t have time for the “making-of” part. Below is the puppet frolicking in a real horse environment: Sandown Race Course in the UK. “Dirty Jobs” is a success because of Mike Rowe and Mike Rowe is a success because of “Dirty Jobs.” He’s earned it. After several years of making sure he only took jobs with plenty of vacation, Rowe is now working constantly, and he’s become an advocate for the blue collar workers that he shadows on the show. The San Francisco Chronicle provides a nicely in-depth look at Rowe’s career and how “Dirty Jobs” came into being. A supplemental blog post reveals the lurid details behind his firing from QVC, related to inappropriate behavior with a nun doll. In researching the Seattle Center observation wheel, I discovered that when the Space Needle first opened for the World’s Fair it had a carillon that was played several times a day. The operator console was at the bottom of the Needle and visitors could observe the carillonneur. An automatic player roll could also be used. I haven’t found out when it was removed, but presumably today’s neighbors wouldn’t enjoy a return performance of the 538 bells. Violinist Min-Jin Kym lost her £1.2m violin while in a London sandwich shop this week. Along with the Stradivarius in the case were bows valued at £62,000 and £5,000. The insurance company is offering a £15,000 reward. A worker at the sandwich shop pointed out that Kym and her friends were preoccupied with their computers and phones at the time and not paying attention to their bags. In the historic Niles district of Fremont, California the Niles Essanay Silent Film Museum preserves the memories of early movie days. The Essanay Film Manufacturing Company arrived in Niles in 1912. Having already produced 200 films, they settled in and made even more, including signing Charlie Chaplin for a year in 1914. Today the museum shows films on Saturdays, with traditional piano accompaniment. Museum historian David Kiehn was recently featured on “60 Minutes” for pinpointing the date of the “Trip Down Market Street” film to just days before the San Francisco earthquake in 1906.